Don Carter State Park Horse Trails Now Open! 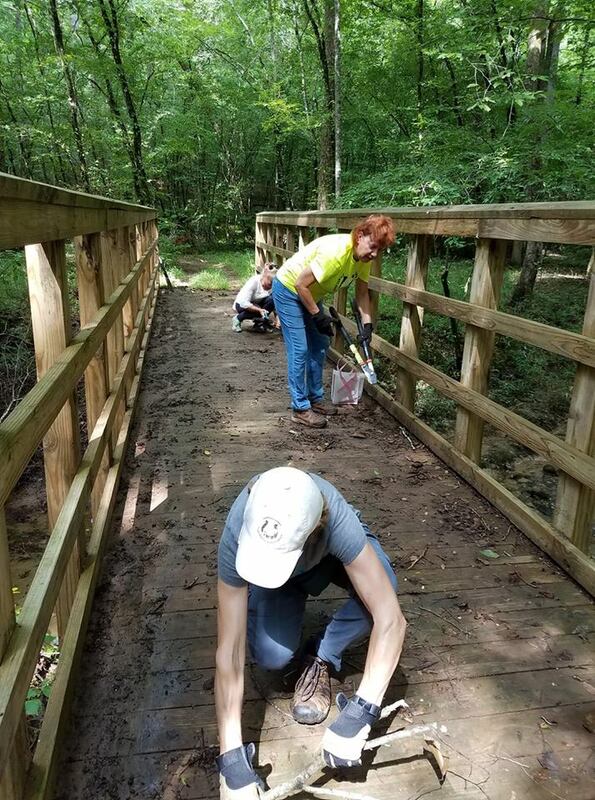 We had a very successful workday on July 9th, 2018. 22 equestrians came out, 10 riders and 12 on foot to help get these trails open. 1) You need to have a copy of your Coggins on you or you can stop by the park office and leave a copy on file with them. 2) The is no ride fee at this time, only a $5 parking fee. That will change so enjoy having no ride fee while it lasts. 3) If you plan on going quite a bit, you may want to buy an Annual Park Pass. If you purchase it through the Friends Group, the money stays at Don Carter. Thank you to all the volunteers, donations, and Cliff Ainsworth-Park Manager for making this long awaited day happen. The First Amendment to the United States Constitution prevents, among other things, curtailing freedom of speech and requires the right to peaceably assemble. With this in mind comes the announcement from the Rainbow Family of Living Light that they have selected the Bull Mountain area of the Chattahoochee National Forest for their annual gathering. This event will occur from now until after July 4 and our area will be an access point. Please be aware that neither Lumpkin County nor the US Forest Service is legally able to prevent this gathering. The majority of impact will be to Forest Service land, but the gathering may be as large as 20,000 people, which will also cause local impacts. Forest and county roads, especially in the Nimblewill area, are expected to be very congested during the event and road closures and/or traffic detours should be expected. It is recommended that you avoid the access points for their campsite as much as possible. The May 2013 issue of Trail Blazer magazine had a nice article about CTHA and our work on the trails in northeast Georgia. You can read the article by clicking below. You may have heard that Georgia is privatizing management of some of our state parks. To date, five have been turned over to a private company. None have horse trails. Click here for the article. for 6 months OR until your coggins expires for the purposes of shows, trail rides, rodeos, etc. In order to obtain this permit, you must supply a current negative coggins and a valid (less than 30 days old) Certificate of Veterinary Inspection (health certificate). These have to be originals or certified, notarized copies. Click Here to get an application from the Georgia Department of Agriculture for the permit.